The health and safety of all breast implants is under question. ESTA touts strong relative safety data for its implants based on just a few historical studies. ESTA's peer-reviewed safety study has apparent conflicts. ESTA's odd acquisitions of distributors raise more questions than answers. + Breast implants are facing heightened scrutiny: The US FDA issued warning letters to implant manufacturers and held an advisory meeting on the subject. France and Brazil have both recalled certain breast implants. Competitors have indicated falling demand across the board. + ESTA claims that its implants are substantially safer than its FDA-approved competitors. A closer look at ESTA's "studies" reveals them to be farcical in design and/or carrying heavy conflicts of interest. In fact, ESTA may have supplied the SEC and investors with misleading information in calling one of its critical studies "independent." + ESTA's entanglements with Dolan Park Hospital in the U.K. appear to have gifted the Company a pliable customer and yielded a vaunted "independent" study of dubious integrity. + ESTA is rife with related party transactions and asset purchases from former distributors. Our back of the envelope estimates suggest at least ~$8 million of revenue (~30% of 2018's revenue growth) was derived from recently purchased distributors and "inside" parties. + Big red flags are apparent in ESTA's accounting in the form of near-zero product return allowance, extremely high levels of inventory, several going concern clauses, a peripatetic CEO and a physically detached CFO. + ESTA defaulted on its debt in 2018 before going public. 2018 interest expense is equivalent to 39% of balance sheet debt. The Company came public with a going concern clause. + ESTA will most likely have to raise equity capital in 2019. + ESTA's valuation is unreasonably high compared to peers and industry deal multiples. + Insiders own 54% of ESTA. Shares came off lockup on January 15, 2019. We suspect insiders were barred from selling until ESTA filed its 10-K which it did on March 20, 2019. + All use of emphasis [boldface] below is added by this author unless otherwise noted. Establishment Labs Holdings, Inc. ("ESTA" or the "Company") sells its Motiva breast implants in 60 countries, excluding the US. Motiva accounts for 90% of revenues. ESTA is the first Costa Rican company to go public on a US exchange. The Company has two manufacturing facilities in Costa Rica. ESTA claims its smooth textured implants achieve the highest safety outcomes in the world due to the "bioengineered cell-friendly surface" of its "SilkSurface" and "SmoothSilk" products. Other products include the Divina 3D simulation device for pre-op visualization & Puregraft gel for tissue contouring. The Company has grown through expanded global distribution. In 2016 and 2017, ESTA began selling through distributors in Australia, Israel, Russia, Saudi Arabia, and South Korea. ESTA initiated a study in April 2018 with the intention of gaining US FDA Premarket Approval ("PMA") for Motiva. As part of this study, ESTA is enrolling 800 patients across 40 sites in the US, Canada, Germany and Sweden. Enrollment for this study is expected to close in Q2 2019. In an August 15, 2018, report, BTIG analyst Sean Lavin wrote of his expectation that ESTA could gain FDA approval in 2021 or 2022. "According to the study, which reflected data from two implant manufacturers, one group of patients with one brand of silicone implants reported a two to eight-times higher frequency of Sjogren syndrome, rheumatoid arthritis, scleroderma and melanoma compared to the general population. The other group of patients with another brand of silicone implants used for reconstruction reported scleroderma, Sjogren syndrome and dermatomyositis more than twice as often as the general public." "Silicone implants are associated with an increased risk of certain rare harms; associations need to be further analyzed with patient-level data to provide conclusive evidence." Source. On February 6, 2019, the FDA issued a letter to healthcare providers seeking to "increase awareness about an association between all breast implants, regardless of filling or texture and Breast-Implant Associated-Anaplastic Large Cell Lymphoma." On March 18, 2019, the FDA sent warning letters to Mentor, a subsidiary of Johnson & Johnson (JNJ) and to Sientra, Inc. (SIEN), two of three approved US implant manufacturers, citing a failure to provide "continuing evaluation by the applicant on the safety, effectiveness, and reliability of the device" which was a condition of reinstating implant sales. On March 25 and 26, 2019 the FDA held an advisory panel to discuss the safety of silicone breast implants, including presentations by MD Anderson and Breast Implant Victim Advocacy. Representatives from the relevant European and Canadian regulatory bodies also attended. Since the MD Anderson study was published, Brazilian health authorities (#2 market for breast implants market in the world) and French health authorities have suspended the sales of certain breast implants. On February 19, 2019 Health Canada announced an investigation into implants to be completed this spring. "Motiva Implants are clearly differentiated from any other implant sold today. And we believe this [indiscernible] result in fewer complications than textured or traditional smooth implants." "Especially in these times, our story is resonating more than ever as surgeons and women seek both an improved safety profile and a natural aesthetic that is more in line with their expectations." ESTA's claims of a favorable market shift seem unlikely given that every US FDA-approved implant manufacturer including Allergan PLC (AGN), the world's largest, offers smooth implant products. Furthermore, there is evidence of breast implant demand falling across the board regardless of texture type given recent results from SIEN which derives only ~5% of its breast implant revenues from textured products. "A recent dialogue with plastic surgeons indicates that consultations and procedure volumes in the first quarter have declined modestly due to the media coverage of breast implants, that has increased over the last few months. We expect this to potentially continue into the second quarter and impact the first half of the year." Following the call, William Blair analyst Margaret Kaczor cut her SIEN breast implant revenue estimate by 17% for 2019 and 20% for 2020. "While the majority of patients who develop BIA-ALCL have had textured implants, and most cases reported in the literature describe individuals who have had textured implants, there have been reports of BIA-ALCL in patients with smooth-surfaced implants and many reports do not include the surface texture of the implant at the time of diagnosis. The denominator for the number of textured and smooth implants in the US is also not known to determine whether relatively more cases are observed with one implant type versus another implant type." Source. Given heightened scrutiny of breast implants in both the US and abroad, we expect regulators to carefully inspect all manufacturer safety claims. Careful examination of the studies ESTA relies upon to make its safety claims reveal significant red flags and incidents of heavily conflicted researchers. ESTA's S-1 details three studies on which the Company bases its safety claims the (1) Post Market Surveillance Study (2) Dolan Park Clinic "Independent" Study and (3) a Prospective Trial in Costa Rica. ESTA claims to have less than a 0.1% rate of capsular contracture and ruptures compared to respective averages of 14.0% and 14.6% for its FDA-approved competitors. These odd claims are based on the Company's "post market surveillance data" which use self-reported information. Data were only included if patients or doctors chose to reach out directly to ESTA, the product manufacturer. The data was not collected at mandatory follow-ups as is typical of post-market surveillance studies. ESTA is clear on this point, stating in its June 21, 2018 S-1 that "In contrast to the above competitor data, our data is self-reported rather than collected at mandatory follow-ups and was generated solely for our post-market surveillance…" Furthermore, the data was "internally tracked" allowing room for manipulation. The data also exclude certain reoperations "not related to safety" in the subjective opinion of ESTA. Sientra (SIEN), Allergan (AGN) and Mentor's results reflect peer-reviewed multi-year studies conducted by scientists. ESTA's "surveillance" lacks academic rigor and is not comparable to the results of peer-reviewed scientific studies conducted by its competitors. In our opinion, this presentation by ESTA is suspiciously disingenuous and arguably reckless, given apparent conflicts of interest around these safety claims. The Dolan Park Clinic ("Dolan Park") in Bromsgrove, England conducted an "independent" study of the safety of ESTA's Motiva implants from April 2013 to April 2016 (Sforza et al.) culminating in a peer-reviewed article in the Aesthetic Surgery Journal on September 14, 2017. The study is the only peer-reviewed comprehensive study on the safety of ESTA's implants with a meaningful sample size. It is therefore deeply important to the company. The result of this "independent" single site three-year study showed "overall rates of complication and reoperation of 0.76% over an interval of three years" versus three-year reoperation rates of approximately 8.4% for ESTA's FDA-approved competitors. "During the study period, Prof. Sforza declared no potential conflicts of interest with respect to the research, authorship, and publication of this article. In 2017 (after the study was completed and was submitted to this journal), Prof. Sforza accepted a position at Establishment Lab's Medical Advisory Board." However, according to an August 16, 2018 correspondence letter with the SEC, ESTA discloses "Dr. Sforza also received an option grant in September 2016 for 36,953 Class A Ordinary Shares." This would seem to directly contradict Dr. Sforza's peer-reviewed article stating that he accepted a position in 2017 and declared "no potential conflict of interest." This quantity of shares is worth nearly $900,000 today. According to the editors of the Aesthetic Surgery Journal, Dr. Sforza submitted the article for publishing on December 17, 2016. Therefore, Dr. Sforza had already received compensation from ESTA when he chose to submit the article for publishing. A July 2016 supply agreement filed in ESTA's original S-1 makes mention of a "proprietary Sforza Bulb Side-Port Injector designed by" the Company. Could it be a coincidence that ESTA "designed" a "proprietary" medical tool and happened to apply the Sforza name to it? If he was involved, was Dr. Sforza paid for this work? 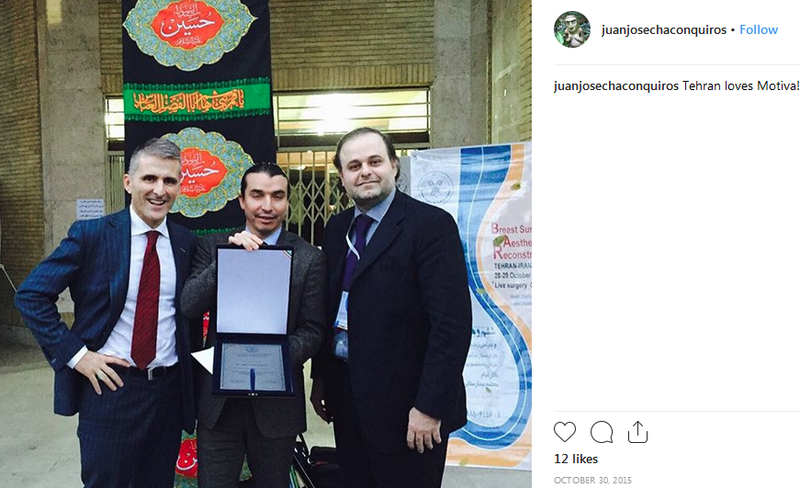 ESTA CEO Juan José Chacón-Quirós' Instagram account and the Facebook page of ESTA is a treasure trove of proof that Dr. Sforza was deeply involved with ESTA dating back into the Dolan Park Study's study period (April 2013 to April 2016) for which he declared "no potential conflicts of interest." Chacón-Quirós posted a photo on October 30, 2015 (during the study period) captioned "Tehran loves Motiva!" showing himself (center) and Dr. Sforza (right) together at an event in Iran. 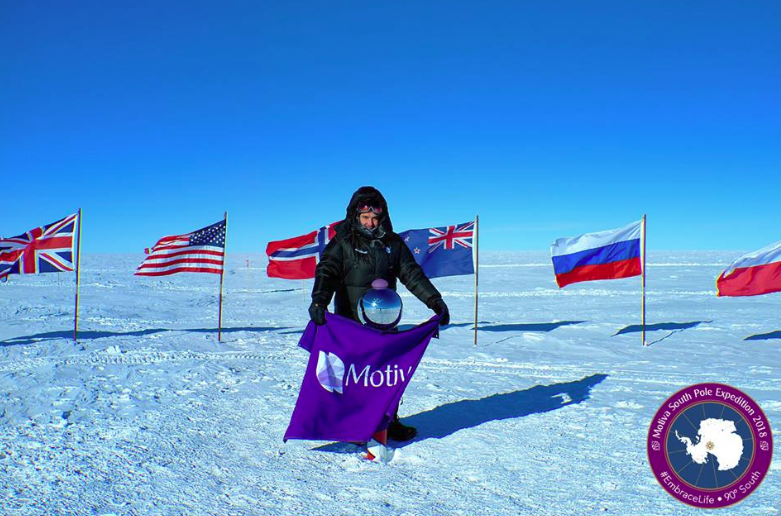 On December 2, 2015 (during the study period), Dr. Sforza gave a speech in Germany promoting Motiva. A video of the speech posted to YouTube by former ESTA distributor Menke Med GmbH ("Menke Med") includes Dr. Sforza saying that the Dolan Park Clinic's former breast implant supplier was AGN who threatened him with "legal actions" and "recently asked my hospital to fire me." These remarks occur around the 31-minute mark. 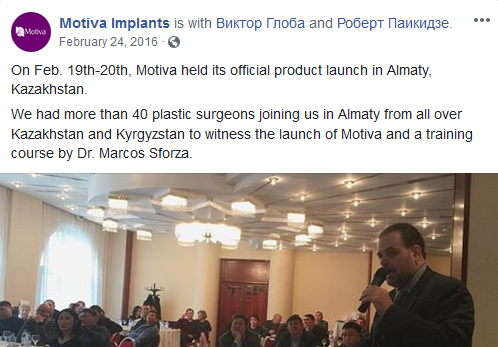 Furthermore, according to ESTA's Facebook page, Dr. Sforza gave a "training course" at a February 24, 2016 Motiva product launch in Almaty, Kazakhstan during the study period. 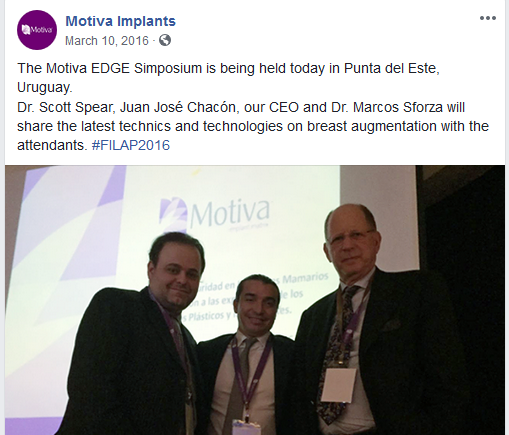 Dr. Sforza spoke at a Motiva EDGE Symposium on March 10, 2016 (again during the study period) in Uruguay according to the Company's Facebook page. It would be highly unusual if Dr. Sforza was not paid to travel as far and wide as Uruguay, Iran and Kazakhstan to give "training courses" on the Motiva product all during the study period. Why would this accomplished surgeon fly around the world promoting a product without compensation or the promise of compensation? One surgeon we spoke with said this level of engagement without compensation is "unthinkable" in the industry. In the aforementioned August 16, 2018, correspondence with the SEC, ESTA claims they "did not commission the study and that it was an independent academic study conducted and published by Dr. Sforza and his institution." This statement would appear to be at odds with Dr. Sforza's extensive involvement with ESTA during the study period. Furthermore, the study itself states "This article was supported by Establishment Labs (Alajuela, Costa Rica), who co-funded the development of this supplement." Today, Dr. Sforza serves as "coordinator of the Company's medical advisory board" receiving $10,000 to $15,000 per month in cash compensation on top of the 36,953-share option grant package received in September 2016 and a 68,233-share grant provided in April 2018. The market value of these shares is ~$2.5 million. The Dolan Park study clearly does not meet the smell test for "independence" and is filled with conflicts. It appears ESTA may have provided misleading information to the SEC and investors in its July 17, 2018 IPO and/or the Aesthetic Surgery Journal about the nature of the "independent" study conducted by Dr. Sforza. If this is the case, then ESTA could face legal and regulatory consequences. Cannell Capital reached out to ESTA's designated investor relations professional on April 3, 2019, to ask for a comment about the apparent conflicts in the Dolan Park study. We have not received a substantive reply as April 9, 2019, the date of this article's publication. ESTA's ties with the Dolan Park Clinic go even deeper; we explore this further below. ESTA's S-1 touts an ongoing study of patient safety being conducted in ESTA's own Costa Rica. "…a 10-year prospective trial for 233 patients in Costa Rica…interim results from the current study include six-year data for 35 patients and three-year data for 79 patients, and to date there have been no reported implant ruptures, capsular contractures or adverse event-related reoperations in these patient cohorts." Source. This study is decidedly not independent as it is being conducted solely by the Company. Moreover, the study is very small with fewer than 80 patients. ESTA's public filings disclose that "Both of the surgeons who conducted this study are related to our chief executive officer." This likely includes the CEO's brother who is also a member of ESTA's medical board. Dr. Manuel Chacón-Quirós has received options from ESTA and is paid "cash reimbursement of up to $4,500 per day as such services are rendered." During the years ended December 31, 2018, and December 31, 2017, ESTA paid Dr. Manuel Chacón-Quirós $90,000 and $120,000, respectively. In our opinion ESTA's self-reported safety data, the Dolan Park study and the ongoing Costa Rican study do not achieve even a basic level of academic rigor. We believe that all three studies seem to lack true independence. Given regulatory scrutiny around breast implants, the Company's safety certifications could be at risk once the questionable nature of its studies becomes clear. 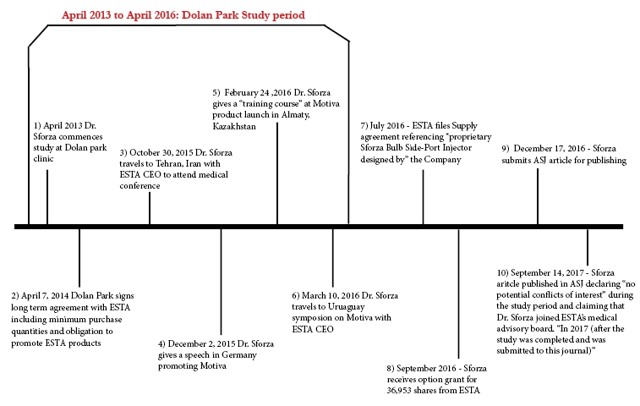 In addition to Dr. Sforza serving on ESTA's medical board and publishing a critical "independent study", it appears that Dolan Park and the Company have a deeper connection. In ESTA's amended S-1 filed with the SEC on July 13, 2018, the Company includes an exhibit showing its supply agreement with The Hospital Group, owner of the Dolan Park Clinic. The supply agreement is dated February 7, 2014, coincidentally in the middle of the study period for Dr. Sforza's Motiva article. 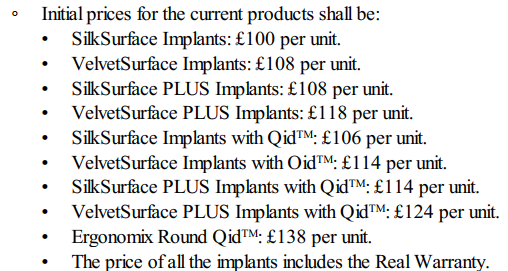 According to these terms, ESTA can invoice Dolan Park upon shipment of implants as opposed to upon implantation/use. The agreement later confirms that Dolan Park is to "pay in full and in Pounds (GBP) each invoice issued by" the Company. We believe this is irregular and suggestive of improper revenue recognition. Furthermore, how is it that ESTA can modify any product at any time without Dolan Park's consent and yet Dolan Park must purchase it? This seems dubious from a medical and ethical perspective. The contractual obligation of Dolan Park to "promote the use of the products" further calls into question the independence of Dr. Sforza's study. Source: The prices at which ESTA will sell implants to Dolan Park under the agreement appear to be meaningfully below market value at an average of ~$150 per unit. The supply agreement refers to these as "special prices." The supply agreement also contained minimum purchase quantities. For the period of March 2016 to March 2017, Dolan Park was required to buy 5,000 units from ESTA. If we assume the average per unit price of ~$150, this equates to ~$0.8 million in revenues or ~4% of the revenues the Company booked in 2016. The original Dolan Park supply agreement lasted three years from March 1, 2014 to March 1, 2017. The supply agreement states that "unless otherwise terminated by any party giving the other six months' prior notice before any expiry, this Agreement will be renewed for successive periods of three commercial years." ESTA's 10-K filed on March 20, 2019 confirms the Company continues to have a "long-term supply agreement" with Dolan Park. Dolan Park is clearly critical for ESTA. The clinic has given ESTA an "independent" study, the head of its medical advisory board and demand for breast implants on flexible terms. In exchange, it appears ESTA has given Dolan Park not only cut-rate implants but (as we detail below) a system that likely benefits the clinic's owner. ESTA requires in the Dolan Park agreement that obligations "shall be fulfilled by its local distributor Aesthetic Healthcare Ltd."
Aesthetic Healthcare LTD appears to be registered in the Cayman Islands. A company with a very similar name, Aesthetic Healthcare Consulting LTD, is also registered in the Cayman Islands. According to the International Consortium of Investigative Journalists' Offshore Leaks Database, Stephen McNerlin is one of two shareholders in Aesthetic Healthcare Consulting Ltd. According to Linkedin, one Stephen McNerlin is purportedly located in the Cayman Islands and describes himself as "retired at The Hospital Medical Group Ltd." Coincidentally the same The Hospital Medical Group Ltd. owns the Dolan Park Clinic. An April 26, 2009, article by The Times of London claimed that Stephen McNerlin was the largest shareholder in The Hospital Medical Group with a 75% stake. ESTA appears to have a "you wash my back I wash yours" relationship with Dolan Park. ESTA gives generous compensation to Dolan Park employee Dr. Sforza and sells the hospital implants at below-market rates. In return it appears Dolan Park agrees to highly flexible contractual terms with ESTA, serves as a consistent customer of its products and facilitated the generation of an "independent study." In 2015, re-acquired distribution rights from Cyprus-based Novaform for cash and stock. In 2016, acquired distributors in Brazil, Belgium and France. In 2017, ESTA acquired assets (likely inventory) from a distributor in Sweden before establishing its own Swedish subsidiary. In 2018, acquiring distributors in each of Spain, Germany and the UK. The serial acquisition of distributors is a red flag. The acquisitions ESTA has detailed publicly include the re-purchase of inventory previously sold by ESTA to the distributor being acquired. This system would allow ESTA to "buy" revenue using its balance sheet. Obviously, this is not sustainable. An asset purchase agreement filed as an exhibit to ESTA's October 4, 2018 8-K stated that the Spanish distributor being acquired owed ESTA ~€2 million (~$2.3 million) and that "the assets purchased included all existing inventory previously sold by the Company." Per the 10-K ESTA ultimately paid $3.6 million including $1.8 million in cash to acquire the Spanish distributor. In the purchase price accounting for the transaction, ESTA ascribed $3.56 million of market value to the inventory. We can treat the ascribed fair value as an estimate of the revenue ESTA would have earned from selling the same inventory to the Spanish distributor historically. This method likely understates revenue assuming the distributor did sell at least some product to clinics. Revenue of $3.56 million represents ~6% of revenues realized by ESTA in 2018 and 14% of revenue growth. "The assets purchased included all existing inventory previously sold by the Company to the Germany Seller and all customer relationships and contracts. 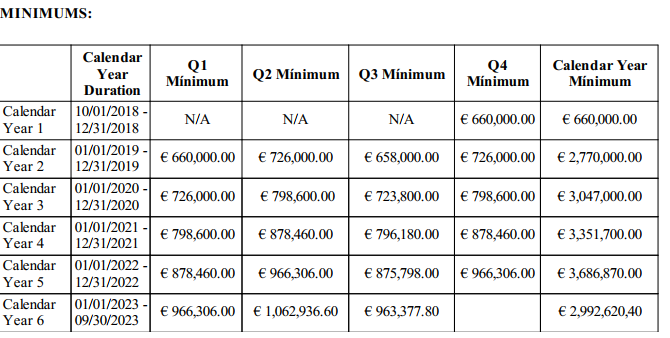 The aggregate purchase price for the assets purchased was the aggregate sum of book value of the inventory at the time of the transaction plus a cash payment of up to a maximum of one million nine hundred twenty thousand euros (€1,920,000)." ESTA's 2018 10-K filed March 20, 2019, shows that the Company ascribed fair market value of $2.1 million to the value of inventory acquired by the dealer. Using the ascribed value, we can estimate ESTA derived at least $2.1 million in revenue from the German distributor equal to ~3% of 2018 revenue or ~8% of revenue growth. "Our distributor partners have given us strong starts in Germany and Spain, and by acquiring these assets we will be able to capitalize on our early success to transition to a direct sales force that should allow us to continue to expand our market position." 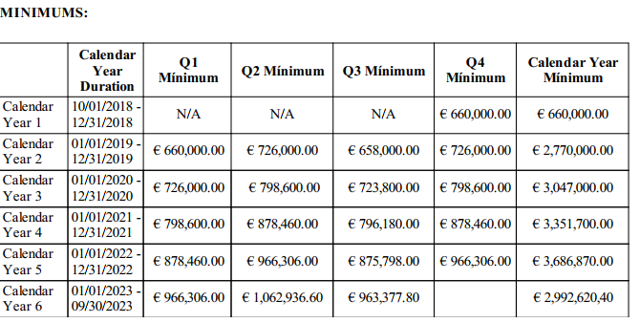 However, the German deal is unique in that it contains a "commercial agency agreement" wherein ESTA will be making ongoing milestone-based payments to Menke Med of €360,000 to €480,000 per year for hitting minimum sales targets. The agreement says that Menke Med will be ESTA's "exclusive commercial agent in Germany to promote, market and sell the Company's products" of its products and will "assist in the execution of orders from customers in the territory." Does this sound like a direct sale to you? Menke Med's 2019 minimum target is ~$3.1 million or ~4% of 2019 consensus revenues. ESTA has structured this deal in such a way that bonus payments made to Menke Med for hitting targets will not be considered commissions but acquisition-related milestone payments. ESTA's 2018 10-K discloses a small September 2018 acquisition of assets from Belle Health LTD in the UK ascribing $235,000 in fair value to its inventory. Taken in total, we estimate these three distributor asset acquisitions could have accounted for ~$6 million in revenue equal to ~10% of 2018 total revenue and ~22% of 2018 revenue growth. Note that these are only the distributor acquisitions for which we have detailed financial information. The Company has, by our count, conducted at least eight asset transactions with distributors since 2015. This financial chicanery makes it impossible to tell what ESTA's real organic growth is and what demand, if any, exists for the Company's products. As the Menke Med deal demonstrates, claims that this buying spree is driven by a desire to sell directly to doctors is farcical. How many distributors is ESTA selling to today with a tacit agreement for a future buy-out? "During the year ended December 31, 2018 and 2017, the Company recorded revenue of $0.9 million and $0.6 million, respectively, for product sales to Herramientas Medicas, S.A., a distribution company owned by a family member of the Chief Executive Officer of the Company." Source. "During the year ended December 31, 2018 and 2017, the Company recorded revenue of approximately $40,000 and $0.3 million for product sales to Motiva Netherlands BV, a distribution company owned by Erick Vogelanzeng, our Vice President of Sales, Europe." Source. These insider arrangements, while small, strike us as odd and a continuation of a troubling pattern. Why would ESTA do this? How do these arrangements benefit ESTA shareholders? Beyond the related party transactions and distributor repurchase agreements, ESTA's accounting has red flags in the form of elevated inventory levels, a suspiciously low allowance for returns and material weakness in internal controls. At December 31, 2018, ESTA carried $24.8 million of inventory, up 62% QoQ, imputing an astronomical 343 days of inventory outstanding up from a still high 224 at September 30, 2018. Running at high levels of inventory can be reflective of a "stuffed channel" or a company running higher levels of production than demand warrants to boost gross profit margins. Elevated inventories may relate to the Q4 2018 asset purchase agreements. They may also be explained by the Company's use of consigned inventory wherein product sits on the shelves of hospitals waiting to be implanted. "As of December 31, 2018, an allowance of $52,000 was recorded for product returns. Prior to 2018, returns of products have been de minimis and accordingly no allowance for returns was recorded as of December 31, 2017." This is an unusually low return rate especially if the Company is increasingly selling directly. US competitor SIEN held an allowance for returns equal to $6 million or 9% of 2018 revenues. AGN held a $567 million returns and other allowances account at the end of the year equivalent to ~4% of revenues. ESTA's return allowance is equal to 0.08% of 2018 revenues. Overly-aggressive return rate allowances may help a company boost gross profits as the allowance is subtracted from gross sales. The Company's Q3 10-Q disclosed a material weakness in internal control over financial reporting citing "lack of adequate review of the accounting for debt and standard-to actual inventory costing" and a lack of "accounting and finance professionals with the requisite expertise" at its Brazilian subsidiary. The Company's 2018 10-K says that ESTA resolved the issues identified in Q3 2018 but had a new material weakness in internal control relating to "lack of adequate review over the manual consolidation process." The consolidation process likely refers to the compilation of financials across ESTA's various subsidiaries. On December 31, 2018, ESTA carried $22 million of debt. Total interest expense incurred in 2018 was $8.8 million, implying an effective interest rate for the full year of 40%. Per ESTA's most recent 10-K, total debt has not changed significantly since December 30, 2017. In 2017, ESTA paid interest expense of $10.4 million. "..April 30, 2018, the Company entered into a forbearance agreement with the Lenders, where the Lenders agreed to forebear from exercising certain rights and remedies through May 18, 2018 arising from certain disclosure and other technical defaults under the Madryn Credit Agreement…"
"..on March 23, 2018 and subsequently on April 30, 2018, May 18, 2018 and again on June 8, 2018, we entered into a forbearance agreement with the Lenders, where the Lenders agreed to forebear from exercising certain rights and remedies through July 3, 2018 arising from certain disclosure and other technical defaults under the Madryn Credit Agreement"
ESTA had $52.6 million in cash as of December 31, 2018. The Company's average free cash flow burn through 2018 was ~$6 million per quarter, however ESTA has cited elevated costs moving forward related to the FDA trial. We believe that given the increased expenses ESTA will likely need to do an equity offering by the end of 2019. "Our independent registered public accounting firm has expressed substantial doubt about our ability to continue as a going concern." [Emphasis in original.] Source. Apparently, ESTA CEO Juan José Chacón-Quirós does not like to go to the office. 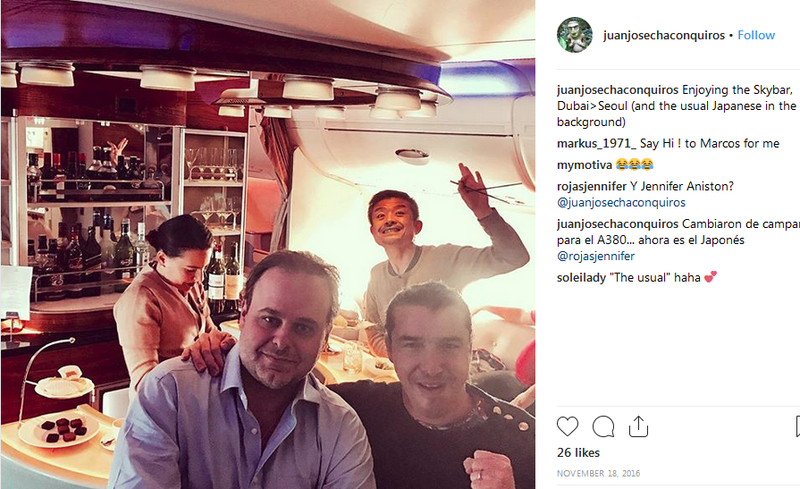 According to his Instagram, since September 30, 2018, Juan José has been to South Africa, Miami, London, France, California, New Mexico, Costa Rica, Japan, the Galapagos Islands (Ecuador), New York, Hong Kong, Russia, Norway, Austria, Utah, Italy, Cuba, Peru and Brazil. He posted a photo from Antarctica on November 23 and another 17 days later on December 10, 2018. This works out to twenty exotic locales over a 23-week period. According to her Linkedin and Facebook, ESTA's CFO Renee Gaeta is based in Santa Barbara, CA, approximately 2,800 miles away from the Company's headquarters in Alajuela, Costa Rica. This strikes us as unusual for a company that does not generate any material revenue in the US and is another financial red flag. Insiders own a significant amount of ESTA: Director Nicholas Lewin owns 37% of shares through Crown Predator Holdings (CPH TU LP), and CEO Juan José Chacón-Quirós owns 12% of shares outright and through Sariel LTD. Insiders came off lockup on January 15, 2019 and were likely restricted from trading until the Company reported Q4 results on March 20, 2019. Given their outsized ownership stake, a decision by insiders to sell could pressure the stock. ESTA trades at a large premium to precedent industry buyout multiples as well. JNJ paid $1.1 billion for Mentor in December 2008 at a multiple of just three times trailing sales. Given ESTA's accounting red flags, lack of scale, cash burn and questionable safety studies, we argue it should trade at a discount to industry peers. If we back out $6 million from purchased distributors and $2 million from Dolan Park from 2018 revenue of $61 million and apply a 2x EV/ Revenue multiple, we obtain a $136 million implied market capitalization or ~$6.68 per share price target, a (72%) decline from current levels. Of course, this valuation does not account for the potential ramifications of rectification, reconciliation and/or investigation into the apparent chicanery which the Company has perpetuated. If, as we suspect, we have only scratched the surface in this report, then ESTA shares could be worthless. Disclosure: I am/we are short ESTA. I wrote this article myself, and it expresses my own opinions. I am not receiving compensation for it. I have no business relationship with any company whose stock is mentioned in this article. Additional disclosure: The above content was written by Cannell Capital LLC. Cannell Capital has sold but not yet purchased shares of Establishment Labs Holdings, Inc. Cannell Capital may buy or sell shares of Establishment Labs Holdings, Inc.in the future. This report is provided for informational purposes only. Any implied recommendation as to whether these shares should be sold or bought is explicitly withheld. Caveat emptor.